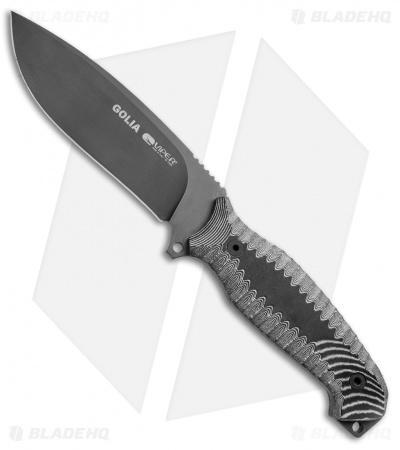 The David and Golia fixed blades from Viper Knives are multi-purpose knives designed for military use. These fixed blades are for users who need tools for field and fighting with the ability to adapt to any situation. The Golia fixed blade is the larger of the two knives. 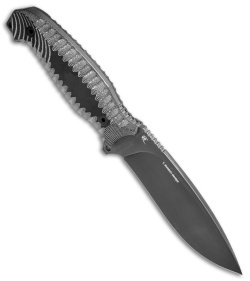 It features a full-tang D2 blade with a slight recurve and jimping on the thumb ramp and spine. A set of Viperskin grip black Micarta scales offer a reliable grip during use. Includes an ambidextrous Cordura sheath with a reversible ballistic rubber core. D2 blade steel offers superior toughness and edge retention. Viperskin textured Micarta handles provide exceptional grip security. 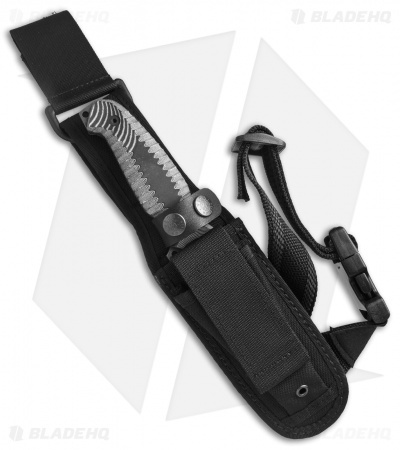 Ambidextrous, MOLLE compatible Cordura sheath. Nice camping/shtf knife, thick sturdy D2 blade which came pretty sharp with a wide spine that should be good for batoning if need be. Nice and heavy feel to it. This is my first micarta handle and I must say I really like it, probably even more than g10. The contours are very comfortable to grip whether hammer or reverse grip is used while not being slippery at all wet or dry. I like that there are 2 lanyard holes on the handle which I assume is for tying to a stick or something to make a spear? The sheath is pretty nice as well. Maybe a little too "tacticool" for my taste but it works well. The pocket on the front was big enough to fit a small Arkansas stone and a large ferro rod. I think later on ill be getting the viper david to go along with it! If I had to give one suggestion to viper would be to clean up the tool marks along the spine of the tang and blade, mine came a bit rough and I had to clean out the lanyard holes which had some sharp edges in both that would cut any lanyard run through it. No biggie though.